I went home early today... I made it a whole 4 hours. I just feel so out of it, and my throat hurts so bad. I've gargled salt water, taken loads of Excedrin and Tylenol Cold. I felt bad leaving early, but I was really no help there. I just couldn't function normally. So I'm taking it easy in my hubby's recliner watching the Braves game with my laptop on my lap. This is the life... now if I could just get the kids to go sleep. I love them, but I should've taken them to grandma's for tonight. 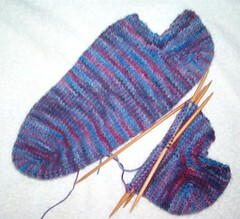 These really knit up fast because they're on size 3 needles (once I got the short row technique down that is). I have to work at 9 am tomorrow, and I'm really hoping I feel better because I can't afford to take off more time from work. Man, the Braves are losing!! Argh! :) Write more later! If your sick like i was it will last forever and change to a chest congestion. Mine was a virus and was easily given to others, and I had to take 3 days of work off and then work two from home!! I wish my blog wasn't broken I have not been able to post for weeks!